Is your dog struggling to cope with a physical issue that is impacting on their behavour? Lifestyle Rehabilitation sessions combine a physiotherapy session with a training and behaviour approach to help manage orthopaedic and neurological canine cases. These sessions are run by Claire North (BIPDT 1st Grade (Hons)) and Hannah Michael (ACPAT Cat A Vet Physio). Sessions are aimed at dogs who have physical issues, such as post surgical cases (spinal or limb) or chronic orthopaedic issues such as Elbow Dysplasia or Hip Dysplasia, and who are struggling from a mental well-being and daily lifestyle perspective. Unfortunately this is the case for the majority of dogs with these kind of physical restrictions. There are many cases, especially in juvenile or high-drive dogs, where restriction of daily exercise routines is necessary in order to successfully manage the physical state of a dog. This can have subsequent negative effects on the dog’s behaviour and development, both in the short- and long-term. Combining a knowledge of the physical limitations and also aims of rehabilitation, alongside training knowledge and skill mean we can hopefully enable a healthier, happy dog. We work closely alongside veterinary guidance and management. If you wish to book a session, please be aware that we will require a veterinary referral from your current vet. We will also maintain open communication with your vet to ensure we have your dog’s full and relevant medical history, and to avoid any conflicting advice. Hannah is a ACPAT Cat A Veterinary Physiotherapist. Hannah was a Chartered Physiotherapist for 5 years prior to her graduation from the Royal Veterinary College in 2005, where she gained a Masters in Veterinary Physiotherapist. She quickly became interested in specialising in canine rehabilitation, and now Hannah runs regular clinics at rehabilitation centres in Yorkshire and Lincolnshire. She is also involved in training Canine Hydrotherapists, teaching on Continuing Professional Development programmes for Vets and Veterinary Nurses, and is also a guest lecturer on Animal Science degree courses. 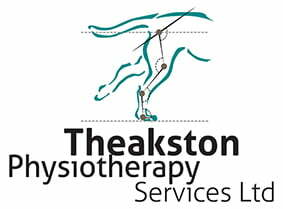 Hannah is the director of Theakston Physiotherapy Services.